1) Only guild members level 20 (i.e. half the current level cap) or above are included in the calculations. 2) The top 50 guilds by total achievement points make the list. 3) Within the list, each guild is ranked in the various categories. The number in parenthesis indicates the guild's rank in that particular category. 4) The guild's average rank, after discarding the best and worst rank, determines the final standing. 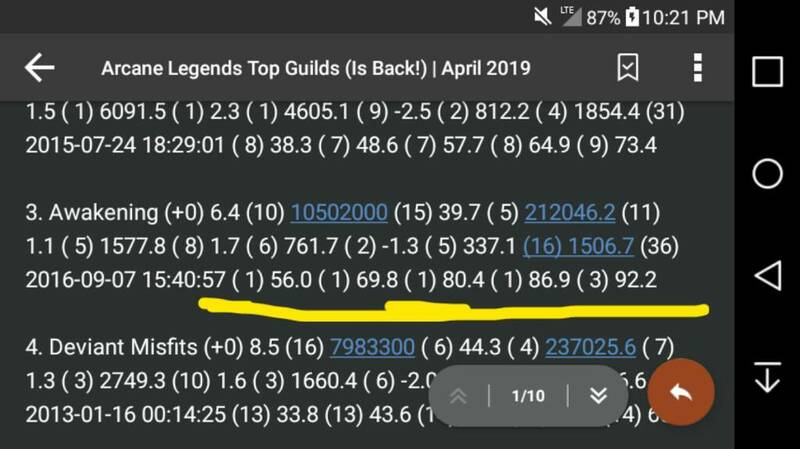 5) If the guild was previously ranked, the number in parenthesis after the guild name indicates the guild's change in rank. 6) A negative x/D ratio means more D than x, and indicates the D/x ratio. 7) Average account age is determined by when the account first started playing Arcane Legends. I don't decide who's best, I just post the math. But if you're wondering, the rankings are based on the collective of the stats you see there. So AP, KDR, Active %, etc etc. are all taken into consideration. Very interesting. May we see the formula used to calculate these to understand more fully which categories are weighed more heavily? Thanks! Update: Dark Legends launch being held back to April!